The Prosthetic Joint Infection GUIDELINES Pocket Guide is based on the latest guidelines of the Infectious Diseases Society of America (IDSA) and was developed with their collaboration. 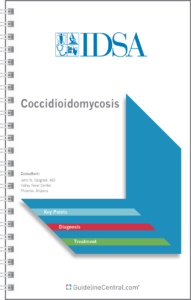 This practical quick-reference tool contains key points, diagnostic recommendations, multiple algorithms, and comprehensive microorganism-specific drug therapy and dosing information. Prosthetic joint infection (PJI) remains one of the most serious complications of prosthetic joint implantation. The cumulative incidence of prosthetic joint infection among the approximately 1,000,000 primary total hip (THA) and knee (TKA) arthroplasties performed in the United States of America in 2009 varies between ~1-2% over the lifetime of the prosthetic joint, depending on the type of prosthesis and whether the surgery is a primary or revision procedure. The management of PJI almost always necessitates the need for surgical intervention and prolonged courses of intravenous or oral antimicrobial therapy. An essential component of the care of patients with PJI is strong collaboration between all involved medical and surgical specialists (eg, orthopedic surgeons, plastic surgeons, infectious disease specialists, internists, etc.). The presence of a sinus tract that communicates with the prosthesis is definitive evidence of PJI (B-III). The presence of purulence surrounding the prosthesis without another known etiology is definitive evidence of PJI (B-III). The presence of acute inflammation as defined by the attending pathologist on histopathologic examination of periprosthetic tissue at the time of surgical debridement or prosthesis removal is highly suggestive evidence of PJI (B-II). Two or more intraoperative cultures or a combination of preoperative aspiration and intraoperative cultures that yield the same organism (indistinguishable based on common laboratory tests including genus and species identification or common antibiogram) may be considered definitive evidence of PJI (B-III). Growth of a virulent microorganism (eg, S. aureus) in a single specimen of a tissue biopsy or synovial fluid may also represent PJI. One of multiple tissue cultures or a single aspiration culture that yields an organism that is a common contaminant (eg, coagulase-negative staphylococci, Propionibacterium acnes) should not necessarily be considered evidence of definite PJI and should be evaluated in the context of other available evidence. The presence of PJI is possible even if the above criteria are not met. (B-III). The clinician should use his/her clinical judgment to determine if this is the case after reviewing all the available preoperative and intraoperative information. If there is a history of prior wound healing problems or superficial or deep infection. Evaluation of the patient with a possible PJI should include a thorough history and physical examination (C-III). Items that should be obtained in the history include the type of prosthesis, date of implantation, past surgeries on the joint, history of wound healing problems following prosthesis implantation, remote infections, current clinical symptoms, drug allergies and intolerances, comorbid conditions, prior and current microbiology results from aspirations and surgeries, and antimicrobial therapy for the PJI including local antimicrobial therapy (C-III). A sedimentation rate or C-reactive protein should be performed in all patients with a suspected PJI when the diagnosis is not clinically evident. The combination of an abnormal sedimentation rate and C-reactive protein seems to provide the best combination of sensitivity and specificity (A-III). A plain radiograph should be performed in all patients with suspected PJI (A-III). Arthrocentesis is also advised in patients with a chronic painful prosthesis in whom there is an unexplained elevated sedimentation rate or C-reactive protein (A-III) or in whom there is a clinical suspicion of PJI. Arthrocentesis may not be necessary if in this situation surgery is planned and the result is not expected to alter management. Synovial fluid analysis should include a total cell count and differential leukocyte count, as well as culture for aerobic and anaerobic organisms (A-III). A crystal analysis can also be performed if clinically indicated. In PJI where the patient is medically stable, withholding antimicrobial therapy for at least two weeks prior to collecting synovial fluid for culture increases the likelihood of recovering an organism (B-III). The patient has a condition or suspected condition or concomitant infection or pathogen (eg. S. aureus) that would make the presence of a bloodstream infection more likely (B-III). Imaging studies such as bone scans, leukocyte scans, MRI, CT and PET scans should NOT be routinely used to diagnose PJI (B-III). The results will affect management, for example in deciding between revision arthroplasty and two-stage exchange (B-III). At least three and optimally five or six periprosthetic intraoperative tissue samples or the explanted prosthesis itself should be submitted for aerobic and anaerobic culture at the time of surgical debridement or prosthesis removal to maximize the chance of obtaining a microbiologic diagnosis (B-II). When possible (see above), withholding antimicrobial therapy for at least two weeks prior to collecting intraoperative culture specimens increases the yield of recovering an organism (A-II).